Let’s say a potential buyer visited your site but somehow the deal bounced without a purchase or filling inquiry form. How will you induce that visitor to convert into a buyer? Here is where Google remarketing can help you. The launch of Google remarketing, specially designed to empower AdWords publisher to grab potential buyers, is one more innovation in the constantly changing marketing scenario. First of all you need to add remarketing tag. It is a kind of code that you will get from your Adwords account. You have to add this code across all the pages. The final step is to run for an Adword campaign with a striking message to demonstrate who visited your service page when they will browse other display network sites. Your remarketing communication will not be exhibited to those who don’t figure on the list. 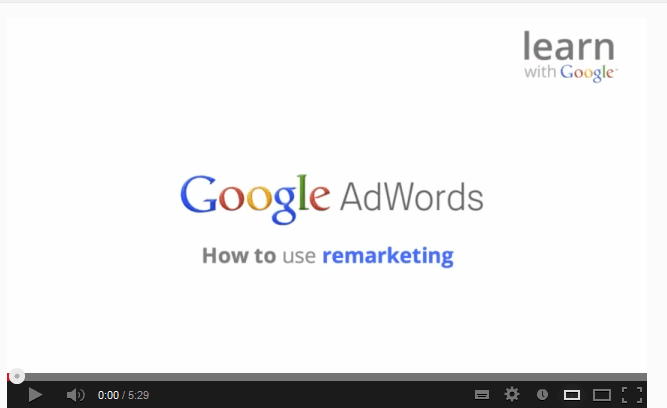 You can check practically with official Google Adwords Video how to use and set up Remarketing Tag and Campaign. Applying Google remarketing code will help to regain visitors by showing them ads on other places like blogs, news website, forums and articles. Remarketing helps to create custom impressive messages/offers which lure potential buyers to revisit your site and complete a purchase successfully. This remarketing feature enables to reconnect with potential buyers/clients who left the website without purchasing or filling inquiry form. When a person is willing to buy services or products it matters how many times that buyer sees you. First-mover advantage: The business can take this advantage if its competitor is not using this approach. Positioning establishment including brand name, image, service values, warranties and packaging. Since not everyone is using this approach, you can go beyond what your competitors are doing. Visuals Ads will create more appealing and interactive effect in the viewer’s mind. Visuals Ads are easy to remember and recall. To re-target people with discount or coupon code if they are bouncing from the shopping cart without completing the purchase. While running a special campaign. On special occasions like Halloween, Valentine’s Day or Christmas. Promotion ending date reminder – Who visited promotion or giveaway page but not enrolled. Reputation building – If you are improving/adding any customer care services. Text ads and image ads should be in separate Ad Groups for perfect Analysis. Image Ads font and color combination should be matched with website to give re-call. Utilize all Ad Builder’s given creative variations and different sizes and shapes to impress viewers. Cleverly use Display Ad Builder Templates to create Ads. Initially start with low bidding to check the trend, clicks and ROI. Build Remarketing list, it can be helpful any time. Create audience lists to create two separate lists – those who already purchased and those who have not purchased. Accordingly decide whom to re-target. If you will face any issue with remarketing lists, tags and ads check your code first using Tag Assistant to verify code placement on any page. Download and install Tag Assistant via the Google Chrome Store to make sure. You can use conversion optimizer to achieve most profitable clicks. There are many other networks who offer remarketing service, but for several reasons I prefer to use Google remarketing for sales improvement and better branding.